Training alongside four ONE World Champions at the famed Team Lakay of Baguio City, Philippines, Filipino mixed martial artist veteran Honorio “The Rock” Banario has his own plans of shining amongst the biggest names in ONE Championship’s lightweight division. The 29-year-old is set to compete in the highly-anticipated ONE Lightweight World Grand Prix opposite dangerous opponent Lowen Tynanes of Hawaii, an undefeated American warrior. Yet despite the challenge that lies before him, Banario remains undeterred and looks to score a huge statement victory at ONE: HERO’S ASCENT. “I plan to show that I am one of the best lightweights in the promotion, and there’s a lot of buzz surrounding our division because of the tournament,” said Banario. Banario and Tynanes will lock horns at the Mall of Asia Arena in Manila, Philippines on Friday, 25 January. But despite being somewhat of an underdog heading into his next matchup, Banario remains confident of victory. “It doesn’t’ matter, I am confident in myself and my team. Through hard work we will achieve great things,” Banario expressed. With a career built around learning lessons, Banario says his 2018, a year wherein he went 2-1, was significant to his development as a fighter. The ONE Lightweight World Grand Prix is certainly no walk in the park. Tynanes represents arguably the toughest challenge among eight of the promotion’s best, but Banario says he looks to put on a show, regardless of who he faces in the ONE cage. One of the new athletes Banario is referring to is former UFC lightweight champion Eddie “The Underground King” Alvarez, who joined ONE Championship last October. If Banario is able to progress against Tynanes, Alvarez could be the guy he faces next. Banario says he just wants to face the best the promotion has to offer. With this tournament format, he can certainly do just that. As such, “The Rock” aims to be the last man standing when all is said and done. 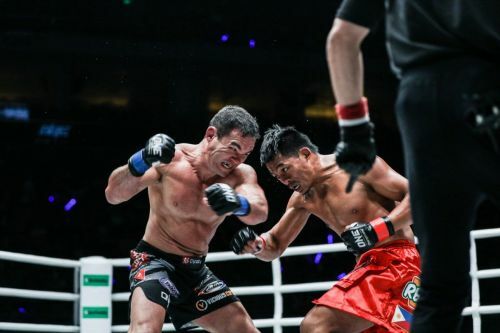 “It is a great way to really see who is the best in the division, apart from my brother Eduard Folayang who’s the World champion,” Banario concluded.